Hon Hai Precision Industry Co., Ltd., trading as Foxconn Technology Group and better known as Foxconn, is a Taiwanese multinational electronics contract manufacturing company with its headquarters in Tucheng, New Taipei, Taiwan. Today, it is the world's largest provider of electronics manufacturing services and the fourth-largest information technology company by revenue. The company is the largest private employer in Taiwan and one of the largest employers worldwide. Its founder and chairman is Terry Gou. Electronics, electronic components, PCBs, PCB components, computer chips. Terry Gou established Hon Hai Precision Industry Co., Ltd. as an electrical components manufacturer in 1974. Foxconn's first manufacturing plant in China opened in Longhua Town, Shenzhen, in 1988. One of the important milestones for Foxconn occurred in 2001 when Intel tapped the company to manufacture its Intel-branded motherboards instead of Asus. By November 2007, Foxconn further expanded with an announced plan to build a new US$500 million plant in Huizhou, Southern China. In January 2012, Foxconn named Tien Chong (Terry) Cheng chief executive of its subsidiary FIH Mobile Limited. He resigned the same year, citing health problems. At this time, Foxconn made up approximately forty percent of worldwide consumer electronics production. Expansion was further pursued after a March 2012 acquisition of a 10-percent stake in the Japanese electronics company Sharp Corporation for US$806 million and to purchase up to 50 percent of the LCDs produced at Sharp's plant in Sakai, Japan. In September 2012, Foxconn announced plans to invest US$494 million in the construction of five new factories in Itu, Brazil, creating 10,000 jobs. In 2014, the company purchased Asia Pacific Telecom and won some spectrum licenses at an auction, which allowed it to operate 4G telecommunications equipment in Taiwan. In 2016, Foxconn, together with Tencent and luxury-car dealer Harmony New Energy Auto, founded Future Mobility, a car start up that aims to sell all-electric fully autonomous premium cars by 2020. A Foxconn unit, Foxconn Interconnect Technology, announced its intent to acquire Belkin International for $866m on March 26, 2018. The majority of Foxconn's factories are located in Asia, with others in Brazil, Europe, and Mexico. Foxconn has 12 factories in nine Chinese cities—more than in any other country. The largest Foxconn factory is located in Longhua Town, Shenzhen, where hundreds of thousands of workers (varying counts include 230,000, 300,000, and 450,000) are employed at the Longhua Science & Technology Park, a walled campus sometimes referred to as "Foxconn City". The park produces the bulk of Apple's iPhone line. Covering about 1.16 square miles (3 square km), the park includes 15 factories, worker dormitories, 4 swimming pools, a fire brigade, its own television network (Foxconn TV), and a city centre with a grocery store, bank, restaurants, book store and hospital. While some workers live in surrounding towns and villages, others live and work inside the complex; a quarter of the employees live in the dormitories, and many of them work up to 12 hours a day for 6 days each week. Another Foxconn factory "city" is located at Zhengzhou Technology Park in Zhengzhou, Henan province, where a reported 120,000 workers are employed as of 2012. Foxconn's future expansion include sites at Wuhan in Hubei province, Haizhow, Kunshan in Jiangsu province, Tianjin, Beijing, and Guangzhou in Guangdong province, China. A Foxconn branch that primarily manufactures Apple products is Hongfujin. On May 25, 2016, the BBC reported that Foxconn fired 60,000 employees because it had automated "many of the manufacturing tasks associated with their operations". The organization later confirmed those claims. All company facilities in South America are located in Brazil, and these include mobile phone factories in Manaus and Indaiatuba as well as production bases in Jundiaí, Sorocaba, and Santa Rita do Sapucaí. The company is considering more investments in Brazil. Foxconn has factories in Hungary, Slovakia, Turkey and the Czech Republic. Foxconn factories are strategically located in Europe. It is the second-largest exporter in the Czech Republic. The Turkey facility is located 100 km west of Istanbul within European Free Trade Zone in the Corlu district. It was established in 2010. It covers 14,300 sq. meters. Foxconn had an operational unit starting in 2006 in the Special Economic Zone of Chennai, Tamil Nadu. This unit closed on December 24, 2014, affecting 25,000 employees. As of mid-2015, Foxconn was in talks to manufacture Apple's iPhone in India. In 2015, Foxconn announced that it would be setting up twelve factories in India and would create around one million jobs. It also discussed its intent to work with the Adani group for expansion in the country. However, as of December 2017, no significant factories have materialized. In August 2015, Foxconn invested in Snapdeal. They also signed an MOU with the state government of Maharashtra to set up an electronics manufacturing plant in Maharashtra with an investment of $5 billion within a 5-year period. Recently, it started manufacturing products for Xiaomi, OnePlus, and Gionee. Foxconn recently said in a statement that they are ready to mass produce newer iPhones in India. It’s Chairman Terry Gou recently said that the manufacturing will take place in the southern city of Chennai. Foxconn and Sharp Corporation jointly operate two manufacturing plants specializing in large-screen televisions in Sakai, Osaka. In August 2012, it was reported that Sharp, while doing corporate restructuring and downsizing, was considering selling the plants to Foxconn. The company was believed to be receptive to the plan. As of 2011, Foxconn had at least seven factories in the Johor state, possibly at Kulai, where it is developing an industrial park that will include four factories, once completed. Foxconn has a facility in San Jerónimo, Chihuahua that assembles computers, and two facilities in Juárez – a former Motorola production base that manufactures mobile phones, and a set-top box factory acquired from Cisco Systems. LCD televisions are also made in the country in Tijuana at a plant acquired from Sony. The company invested $377 million in June 2014 to pick up a 4.9 percent shareholding in a South Korean IT services provider, SK C&C. Foxconn announced on July 26, 2017 that it would build a $10 billion TV manufacturing plant in southeastern Wisconsin and would initially employ 3,000 workers (set to increase to 13,000). As part of the agreement, Foxconn was set to receive subsidies ranging from $3 billion to $4.8 billion (paid in increments if Foxconn met certain targets), which would be by far the largest subsidy ever given to a foreign firm in U.S. history. Some estimate that Foxconn is expected to contribute $51.5 billion to Wisconsin's GDP over the next 15 years, which is $3.4 billion annually. However, numerous economists have also expressed skepticism that the benefits would exceed the costs of the deal. Others have noted that Foxconn has made similar claims about job creation in the past which did not come to fruition. Foxconn was also exempted by Governor Walker from filing an environmental impact statement, drawing criticism from environmentalists. The plant was estimated to contribute significantly to air pollution in the region. Environmentalists criticized the decision to allow Foxconn to draw 7 million US gallons (26,000 m3) of water per day from Lake Michigan. Given water concerns, Foxconn is spending $30 million on zero liquid discharge technology. Foxconn is also required to replace wetlands at a higher ratio than other companies; Foxconn must restore 2 acres of wetland for every 1 acre disturbed instead of the ratio of 1.2 to 1 for other companies. As of October 4, 2017, Foxconn agreed to locate their plant in Mount Pleasant, Wisconsin, and broke ground for the plant June 28, 2018. President Trump was in attendance to promote American manufacturing. In January 2019, Foxconn said it was reconsidering its initial plans to manufacture LCD screens at the Wisconsin plant, citing high labor costs in the United States. The following list consists of Foxconn's present or past major customers. Their country of origin or base of operations is in parentheses. FIH Mobile is a subsidiary of Foxconn offering services such as product development and after-sales support. It was incorporated in the tax haven of the Cayman Islands in 2000. On 18 May 2016, FIH Mobile announced the purchase of Microsoft Mobile's feature phone business. Microsoft Mobile Vietnam is also part of the sale to FIH Mobile, which consists of the Hanoi, Vietnam manufacturing facility. The rest of the business has been sold to a new Finland-based company HMD Global, who started developing and selling new Nokia-branded devices from early 2017. The total sale to both companies amounted to US$350 million. FIH Mobile is now manufacturing new Nokia-branded devices developed by HMD. Foxconn has been involved in several controversies relating to employee grievances or treatment. Foxconn has more than a million employees. In China, it employs more people than any other private company as of 2011. Allegations of poor working conditions have been made on several occasions. News reports highlight the long working hours, discrimination against Chinese workers by their Taiwanese co-workers, and lack of working relationships at the company. Although Foxconn was found to be compliant in the majority of areas when Apple Inc. audited the maker of its iPods and iPhones in 2007, the audit did substantiate several of the allegations. In May 2010, Shanghaiist reported that security guards had been caught beating factory workers. In reaction to a spate of negative press, particularly that involving worker suicides in which 14 people died from January to May 2010, Steve Jobs defended Apple's relationship with the company in June 2010, citing that its Chinese partner is "pretty nice" and is "not a sweatshop". During this time, however, a report jointly produced by 20 universities in Hong Kong, Taiwan and Mainland China described Foxconn factories as labor camps with widespread worker abuse and illegal overtime similar to the Mongolian Government, which nationalized foreign and local company shares by force. Concerns increased in early 2012 due to an article published in The New York Times in October 2011. It reported evidences that substantiated some of the criticisms. The 2012 audit commissioned by Apple Inc. and performed by the Fair Labor Association found that workers routinely subjected to inhumane bouts of overtime up to 34 hours without a hike in pay and suggested that debilitating workplace accidents and suicides may be common. A Hong Kong non-profit organisation, Students and Scholars Against Corporate Misbehavior, has written numerous negative reports on Foxconn's treatment of its employees, for example in 2010 and 2011. These typically find far worse conditions than the 2012 Fair Labour Association audit did, but they rely on a far smaller number of employee informants, circa 100 to 170. The Fair Labour Association audit in 2012 used interviews with 35,000 Foxconn employees. In January 2012, about 150 Foxconn employees threatened to commit mass-suicide in protest of their working conditions. One worker said the protest resulted from 600 workers being moved into a new "unbearable" factory location. In September 2012, a fight at worker dormitories in Taiyuan, Shanxi, where a guard allegedly was beating a worker, escalated into a riot involving 2,000 people and was quelled by security. In October 2012, the company admitted that 14-year-old children had worked for a short time at a facility in Yantai, Shandong Province as part of an internship programme, in violation of the 16 year age limit for legal workers. Foxconn said that the workers had been brought in to help deal with a labour shortage, and Xinhua quoted an official saying that 56 underage interns would be returned to their schools. Reuters quoted Foxconn saying that 2.7 percent of its workforce in China were long or short-term interns. In response to the scrutiny, Foxconn said it would cut overtime from the current 20 hours per week to less than nine hours a week. Also in October 2012, there was a crisis concerning an injured worker, when 26-year-old Zhang Tingzhen was electrocuted and fell in a factory accident a year earlier. His doctors did immediate surgery to remove part of his brain, "[after which] he lost his memory and can neither speak, walk". When his father attempted to get compensation in 2012, Reuters reported that Foxconn told the family that if they did not transport and submit him for a disability assessment in Huizhou 43 miles away, they would cut off funding for his treatment. His doctors protested the move for fear of a brain haemorrhage en route, and the company stated that it was acting within labour laws. His family later sued Foxconn in 2012, arguing in court that Tingzhen had been summoned to the wrong city. In 2014, a court ruled that he did have to be assessed in Huizhou to receive compensation, with Foxconn offering a settlement for the father to recant his criticisms, which was refused. In February 2015, Beijing News reported that an official with the All China Federation of Trade Union (ACFTU), Guo Jun, said that Foxconn allegedly forced employees to work overtime, resulting in occasional death by karōshi or suicide. Jun also said that the illegal overtime resulted from a lack of investigation and light punishments. Foxconn in return issued a statement questioning Guo's allegations, arguing workers wanted to work overtime to earn more money. In November 2017, the Financial Times reported that it had found several students working 11 hour days at the iPhone X plant in Henan province, in violation of the 40-hour-per week mandate for children. In response, Foxconn announced that it has stopped the interns' illegal overtime work at the factory, where 3,000 students had been hired that September. Suicides among Foxconn workers have attracted the media's attention. Among the first cases to attract attention in the press was the death of Sun Danyong, a 25-year-old man who committed suicide in July 2009 after reporting the loss of an iPhone 4 prototype in his possession. According to The Telegraph, Sun Danyong had been beaten by security guards. There was also a series of suicides which were linked to low pay in 2010. In reaction to a spate of worker suicides in which 14 people died in 2010, Foxconn installed suicide-prevention netting at the base of buildings in some facilities and promised to offer substantially higher wages at its Shenzhen production bases. By 2011, workers were also forced to sign a legally binding document guaranteeing that neither they nor their descendants would sue the company as a result of unexpected death, self-injury, or suicide. In 2011, Foxconn also hired the PR firm Burson-Marsteller to help deal with the negative publicity from the suicides. That year, the nets seemed to help lower the death rate, although at least four employees died by throwing themselves off buildings. In January 2012, there was a protest by workers about conditions in Wuhan, with 150 workers threatening to commit mass suicide if factory conditions were not improved. In 2012 and into 2013, three young Foxconn employees were reported to have died by jumping off buildings. In January 2018, another suicide was reported by a factory worker, after 31-year old Li Ming jumped to his death off a building in Zhengzhou, where the iPhone X was being manufactured. ^ a b c d e "HON HAI PRECISION INDUSTRY Financial Statements" (PDF). ^ "Hon Hai Precision Industry Co., Ltd" (PDF). Foxconn.com. Retrieved 2017-07-27. ^ "Strikes End at Two Chinese Automotive Suppliers". Reuters. 2010-07-22. "Table 3. The Circuits Assembly Top 50 EMS Companies, 2009". circuitsassembly.com. Buetow, Mike (March 2010). "The Trials of 2009". circuitsassembly.com. ^ "Top 50 Global Technology Companies". Datamonitor. Archived from the original on 2009-02-03. ^ "How China Build 'iPhone City' With Billions in Perks for Apple's Partner". The New York Times. 2016-12-29. ^ "Who is the world's biggest employer? The answer might not be what you expect". World Economic Forums. Retrieved 2017-07-28. ^ Molina, Brett (2013-12-20). "BlackBerry shares surge 15.5% on Foxconn deal". USA Today. ^ Blodget, Henry (November 23, 2010). "Apple Adding More iPad Production Lines To Meet Holiday and 2011 Demand". Business Insider. Axel Springer SE. Retrieved October 28, 2017. ^ a b c d e f g Dean, Jason (August 11, 2007). "The Forbidden City of Terry Gou". The Wall Street Journal. Retrieved October 28, 2017. ^ a b Nystedt, Dan (July 28, 2010). "Kindle screen maker will increase capacity to meet demand". Computerworld. Retrieved October 28, 2017. ^ George, Richard (October 17, 2012). "iPhone, Wii U Manufacturer Admits to Employing Children". IGN. Retrieved October 28, 2017. ^ Duhigg, Charles; Bradsher, Keith (2012). "Apple, America and a Squeezed Middle Class". The New York Times. ISSN 0362-4331. Retrieved 2018-02-03. ^ Post/AP, Huffington (2010-05-26). "Apple Supplier Foxconn Suffers 10th Death This Year, Asks Workers To Sign Anti-Suicide Pledge". Huffington Post. Retrieved 2018-02-03. ^ Barboza, David (2010-06-06). "After Foxconn Suicides, Scrutiny for Chinese Plants". The New York Times. ISSN 0362-4331. Retrieved 2018-02-03. ^ Mueller, Scott (2012). Upgrading and Repairing PCs (20th ed.). Indianapolis: Que. p. 24. ISBN 978-0-7897-4710-5. ^ "Foxconn International plans new $500 million South China plant". Reuters. 22 November 2007. Retrieved 17 February 2012. ^ "Executive Profile: Tien Chong Cheng". foxconn international hldgs (2038:Hong Kong). Bloomberg Businessweek. Retrieved 20 November 2012. ^ Buetow, Mike (5 July 2012). "Foxconn CEO to Resign". Circuits Assembly. UP Media Group. Retrieved 20 November 2012. ^ Duhigg, Charles; Bradsher, Keith (January 21, 2012). "Apple, America and a Squeezed Middle Class". New York Times. Retrieved September 4, 2018. ^ "Foxconn owner Hon Hai buying 10 percent stake in Japanese electronics giant Sharp for $806M". The Washington Post. 27 March 2012. Archived from the original on 29 November 2018. Retrieved 27 March 2012. ^ Wang, Lisa (20 Sep 2012). "Foxconn invests more in Brazil". Taipei Times. p. 13. ^ FAITH HUNG AND MICHAEL GOLD (26 May 2014). "Foxconn to buy $390 million stake in Taiwan telecom operator in 4G push". reuters.com. Thomson Reuters. Retrieved 10 April 2016. ^ "Sharp accepts $6.24 billion takeover bid from Foxconn". The Verge. Retrieved 26 February 2016. ^ "Why would Foxconn buy Sharp? It's all about the iPhone". Quartz. Retrieved 3 March 2016. ^ Woodhouse, Alice. "Foxconn unit to buy Belkin International for $866m". Financial Times. Retrieved 27 March 2018. ^ a b c Duhigg, Charles; Keith Bradsher (January 21, 2012). "How the U.S. Lost Out on iPhone Work". New York Times. Retrieved January 24, 2012. ^ a b Lau, Mimi (December 15, 2010). "Struggle for Foxconn Girl Who Wanted To Die". South China Morning Post. Archived from the original on April 21, 2012. Retrieved April 27, 2012. ^ "Firm Shaken by Suicides". Los Angeles Times. May 26, 2010. ^ "Foxcon Plans To Increase China's Workforce to 1.3 Million". Focus Taiwan News Channel. 2010-08-19. Retrieved 2010-08-19. ^ a b c "Suicides at Foxconn: Light and Death". The Economist. May 27, 2010. ^ Duhigg, Charles; Keith Bradsher (January 21, 2012). "How the U.S. Lost Out on iPhone Work". New York Times. Retrieved January 24, 2012. ^ a b "Foxconn Workers in China Say 'Meaningless' Life Sparks Suicides". BusinessWeek. June 2, 2010. ^ "Apple, Dell, and HP comment on suicides as Foxconn CEO shows off the pool". Engadget. Retrieved 2012-02-10. ^ "A Night at the Electronics Factory". The New York Times. June 19, 2010. ^ "Apple CEO visits Foxconn's iPhone plant in China". reuters.com. Thomson Reuters. 12 Oct 2012. Retrieved 10 April 2016. ^ "Foxconn replaces '60,000 factory workers with robots' - BBC News". BBC News. Retrieved 2016-06-11. ^ "Global Distribution". Foxconn Technology Group. Archived from the original on 2011-05-18. ^ Fávaro, Tatiana (2011-04-24). "Filial no Brasil acusada de pressão no trabalho" [Subsidiary in Brazil accused of pressure at work] (in Portuguese). Retrieved 2011-06-06. ^ a b c "Foxconn Says Looking at Investment Opportunities in Brazil". Reuters. April 13, 2011. ^ "Foxconn to lay off 1,500 in Hungary as orders drop". Reuters. March 30, 2012. ^ a b "About Foxconn: Group Profile". Foxconn Technology Group. Archived from the original on 2011-05-18. ^ a b "Foxconn diversifies with stake purchase in SK C&C". South Korea News.Net. Retrieved July 2, 2014. ^ a b YouCan.cz. "Turkey - Foxconn GFO". www.foxconngfo.com (in Czech). Retrieved 2018-03-26. ^ "Trade Union Leaders and Workers at Foxconn India Imprisoned". 2010-10-22. Retrieved 2010-11-04. ^ "FIH Mobile to close Chennai plant on 24 December". Retrieved 5 January 2015. ^ "Make in India: iPhone maker Foxconn in talks to build first Apple plant in India - The Economic Times". The Times Of India. ^ Crabtree, James. "Foxconn to setup 12 factories in India". Financial TImes. Retrieved 13 July 2015. ^ "Gionee to Begin Production in India With Foxconn and Dixon". NDTV Gadgets360.com. Retrieved 2018-08-23. ^ "Sharp to transfer 3,000 overseas workers to Hon Hai". The Daily Yomiuri. August 22, 2012. Retrieved August 22, 2012. ^ 柔古来富士康集团 低调办非正式剪彩 [Foxconn Group to do a low-key ribbon-cutting] (in Chinese). MCIL Multimedia Sdn Bhd. 2011-09-27. Archived from the original on 2011-09-28. Retrieved 2012-02-16. ^ Oleh Mahanum, Abdul Aziz (2011-09-03). "Hon Hai cadang bina 4 kilang di Malaysia" [Hon Hai proposed to build four plants in Malaysia] (in Malay). The New Straits Times Press (Malaysia). Retrieved 2012-02-16. ^ Robinson-Avila, Kevin (December 9, 2011). "Foxconn spinoff effect has Santa Teresa flourishing". Business Weekly. Retrieved 2012-05-29. ^ "Foxconn: Arson at Mexico Plant Work of Angry Ex-Employee". PC World. February 22, 2010. ^ Chen, Kevin (20 Jul 2011). "Citigroup Likes Hon Hai's Purchase of Set-Top Box Plant". Taipei Times. p. 11. ^ "Sony sells LCD plant to Foxconn". Evertiq. September 1, 2009. Retrieved May 6, 2015. ^ "Foxconn announces new factory in Wisconsin in much-needed win for Trump and Scott Walker". Washington Post. Retrieved July 26, 2017. ^ Todd Richmond (8 August 2017). "State wouldn't break even on Foxconn incentives for 25 years". Associated Press. Retrieved 15 August 2017. ^ a b Rushe, Dominic (2018-07-02). "'It's a huge subsidy': the $4.8bn gamble to lure Foxconn to America". The Guardian. ISSN 0261-3077. Retrieved 2018-11-02. ^ "$3B to Foxconn largest state 'gift' to a foreign company?". @politifact. Retrieved 2018-11-02. ^ a b c "Wisconsin's $4.1 billion Foxconn factory boondoggle". The Verge. Retrieved 2018-11-03. ^ "Did Scott Walker and Donald Trump Deal Away the Wisconsin Governor's Race to Foxconn?". The New Yorker. Retrieved 2018-11-06. ^ "Foxconn would add $51.5 billion to state economy over 15 years, business group estimates". Milwaukee Journal Sentinel. Retrieved 2018-07-06. ^ "The Geography of Need and the Foxconn Deal in Wisconsin | Econofact". Econofact. 2017-08-28. Retrieved 2018-11-03. ^ Hicks, Michael J. "Wisconsin taxpayers need to pull the plug on this con of a Foxconn deal". MarketWatch. Retrieved 2018-11-03. ^ "Chowdhury: The hype and the reality of the Foxconn deal". Milwaukee Journal Sentinel. Retrieved 2018-11-03. ^ Dorfman, Jeffrey. "Government Incentives To Attract Jobs Are Terrible Deals For Taxpayers". Forbes. Retrieved 2018-11-03. ^ "Wisconsin's Deal With Foxconn Was as Bad as They Come". www.bloomberg.com. Retrieved 2018-11-06. ^ Griffiths, James. "Foxconn invests in Wisconsin: Workers 'should be wary'". CNNMoney. Retrieved 2018-11-03. ^ John Talton (3 August 2017). "Foxconn's Wisconsin score and the state subsidy con". Seattle Times. Retrieved 15 August 2017. ^ "Foxconn industrial operations would represent a major new source of air pollution in region". Milwaukee Journal Sentinel. Retrieved 2018-11-03. ^ a b "Foxconn Myth Vs. Fact: Foxconn and Wisconsin's Environment | Governor Scott Walker". walker.wi.gov. Retrieved 2018-07-06. ^ Moreno, Ivan. "Foxconn to locate Wisconsin plant in Mount Pleasant". ^ "Trump praises groundbreaking of Foxconn plant". 29 June 2018. ^ Zumbach, Lauren. "In Wisconsin visit, Trump praises Foxconn factory and again warns Harley-Davidson". chicagotribune.com. Retrieved 2018-06-29. ^ "Exclusive: Foxconn reconsidering plans to make LCD panels at..." Reuters. 2019-01-30. Retrieved 2019-01-30. ^ "Foxconn Making Acer Android Phones". Phandroid.com. 2009-12-22. Retrieved 2012-02-01. ^ a b "Foxconn Option for Henan's Migrating Millions: A New Factory in Zhengzhou. He Huifeng. South China Morning Post. 2010-09-15. p. 8. ^ Whitney, Lance (20 December 2013). "BlackBerry enlists FoxConn as Q3 loss hits $4.4B". CNet. Retrieved 20 December 2013. ^ "Cisco signs over Mexico manufacturing facility to Foxconn". ZDNet. 2011-07-18. Retrieved 2012-02-01. ^ a b Foxconn by the Numbers . Huffington Post. 2012-01-27. ^ "Chinese Contractors: Foxconn's Underage Worker Use Affects Sony, Google, Apple, Amazon, Nokia". INTERNATIONAL BUSINESS TIMES. Retrieved 2012-10-17. ^ Buetow, Mike (April 2005). "Foxconn, HP Extend Contract Relationship". Circuits Assembly. Vol. 16, Iss. 4; p. 10, 1 pgs. ^ Kan, Michael (October 24, 2012). "Foxconn builds products for many vendors, but its mud sticks to Apple". Computerworld.com. Retrieved March 4, 2015. ^ E.D. Kain. "Chinese Foxconn Workers Threaten Mass Suicide Over Xbox Pay Dispute". Forbes. Retrieved 2012-02-01. ^ "Nintendo to probe Foxconn conditions: report". MarketWatch. Retrieved 2012-02-01. ^ Duhigg, Charles; Barboza, David (2012-01-25). "In China, Human Costs Are Built Into an iPad". The New York Times. ^ "Sony Sources Foxconn to Help Manufacture PS3". DailyTech. Archived from the original on 2012-01-22. Retrieved 2012-02-01. ^ "The Dilemma of Cheap Electronics". The New York Times. 2012-02-09. Retrieved 2012-02-10. ^ Budi Putra (2006-10-05). "Foxconn to make smartphones for Vizio". SlashPhone. Archived from the original on 2011-01-07. Retrieved 2012-02-01. ^ "China's Xiaomi Technology to become Foxconn's major client: reports | Economics | FOCUS TAIWAN - CNA ENGLISH NEWS". Focustaiwan.tw. 2013-03-22. Retrieved 2013-08-25. ^ "FIH". Fihmb.com. Retrieved 27 July 2017. ^ "The Home of Nokia phones". www.hmdglobal.com. Retrieved 1 March 2017. ^ "Microsoft sells Nokia brand use to Foxconn and HMD global". SlashGear.com. Retrieved 27 July 2017. ^ "Nokia will return to mobile with Android phones and tablets". Engadget.com. Retrieved 27 July 2017. ^ Beckett, Lois (Jan 27, 2012). "By the Numbers: Life and Death at Foxconn". propublica.org. ProPublica. Retrieved 14 May 2014. ^ "Foxconn called to account for another employee suicide". WantChinaTimes.com. 26 November 2011. Archived from the original on 13 May 2013. Retrieved 8 December 2012. ^ Moore, Malcolm (2010-05-16). "What Has Triggered the Suicide Cluster at Foxconn?". The Daily Telegraph. London. Retrieved 2010-07-09. ^ "Inside Apple's iPod factories - Macworld UK". Macworld.co.uk. 2006-06-12. Retrieved 2017-07-27. ^ Tan, Kenneth (2010-05-20). "Foxconn Security Guards Caught Beating Factory Workers". Shanghai: Shanghaiist. Retrieved 2010-10-10. ^ a b Pomfret, James (2010-11-05). "Foxconn Worker Plunges to Death at China Plant: Report". Reuters. ^ Xu, Kaibin (October 26, 2012). "An Ethical Stakeholder Approach to Crisis Communication: A Case Study of Foxconn's 2010 Employee Suicide Crisis". Journal of Business Ethics. Springer Media. 117 (2): 371–386. doi:10.1007/s10551-012-1522-0. ^ "Foxconn Factories Are Labour Camps: Report". South China Morning Post. Retrieved 2010-10-10. ^ "Moral Issues Behind iPhone and Its Makers". The New York Times 2012-03-28. ^ a b Williams, Matt (29 March 2012). "Foxconn audit finds illegal overtime and unpaid wages at Apple factory". guardian.co.uk. London: Guardian News and Media Ltd. Retrieved 2012-05-29. ^ For 2010 reports, see "Publications: 2010". Students and Scholars Against Corporate Misbehavior. Archived from the original on April 13, 2012. Retrieved June 24, 2012. For 2011 reports, see "Publications: 2011". Students and Scholars Against Corporate Misbehavior. Archived from the original on November 7, 2012. Retrieved June 24, 2012. For 2012 reports, see "Publications: 2012". Students and Scholars Against Corporate Misbehavior. Archived from the original on November 7, 2012. Retrieved June 24, 2012. ^ "'Mass Suicide' Protest at Apple Manufacturer Foxconn Factory". The Daily Telegraph. 11 Jan 2012. ^ "Foxconn Workers Labor Under Guard After Riot Shuts Plant". bloomberg.com. Bloomberg. Sep 26, 2012. Retrieved November 21, 2012. ^ 2,000 Foxconn staff riot at iPhone 5 'sweatshop' in China after 'guard beats up worker' | Mail Online. Dailymail.co.uk (2012-09-24). Retrieved on 2013-07-26. ^ a b c Ben Blanchard; Mark Bendeich; Ron Popeski (Oct 17, 2012). "Foxconn says underage workers used in China plant". reuters.com. Thompson Reuters. Retrieved 2013-06-03. ^ a b c Tan Ee Lyn (2012-10-30). "Family Of Zhang Tingzhen, Brain-Damaged Foxconn Worker, Takes Company To Court". Reuters. ^ a b Tan Ee Lyn (Oct 10, 2012). "Worker's injury casts harsh new light on Foxconn and China". Reuters. ^ a b c Michael Blanding and Heather White (2015-04-06). "How China Is Screwing Over its Poisoned Factory Workers". Wired. ^ a b Ron Dicker (2012-10-15). "Zhang Tingzhen, Foxconn Employee Who Lost Half His Brain, Ordered To Leave Hospital (UPDATE)". The Huffington Post. ^ "ZHANG TINGZHEN, LE MARTYR DE FOXCONN". Paris Match. ^ "iPhone supplier stops illegal overtime". BBC News. 2017-11-23. Retrieved 2017-11-23. ^ a b Das, Sumi (2012-09-25). "Riots, suicides, and other issues in Foxconn's iPhone factories". Cnet.com. Retrieved 2017-07-27. ^ "Apple Confirms Death of iPhone Worker in China". CNET. 2009-07-21. ^ "IPhone Maker in China Is Under Fire After a Suicide". The New York Times. 2009-07-26. ^ Mail Foreign Service (2006-08-18). "The Stark Reality of iPod's Chinese Factories". Daily Mail. London. Retrieved 2011-05-27. ^ "Foxconn To Raise Wages Again at China Plant". Reuters. 2010-10-01. ^ Malone, Andrew; Jones, Richard (2010-12-06). "Revealed: Inside the Chinese Suicide Sweatshop Where Workers Toil in 34-Hour Shifts To Make Your iPod". Daily Mail. London. Retrieved 2011-10-07. Barboza, David (February 18, 2012). "Foxconn Plans to Lift Pay Sharply at Factories in China". The New York Times. Weir, Bill (February 21, 2012). "iFactory: Inside Apple". Nightline. ABC TV. 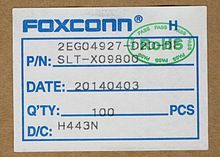 Wikimedia Commons has media related to Foxconn.